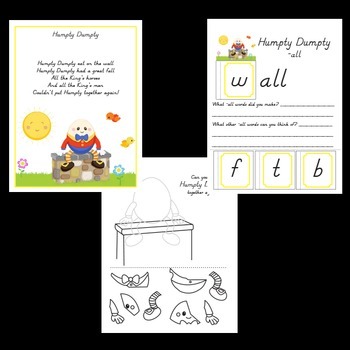 This download includes 43 pages of Nursery Rhymes, worksheets and activities. For each Nursery Rhyme included, there are 1 - 4 associated worksheets/activities. They include math (telling time, counting, addition, etc), literature (word families/rhyming, retelling the story, comparisons, etc) and science (life cycles of amphibians and plants) common core skills. There are worksheets, books, and fun activities, like mazes. These are great for introducing classical nursery rhymes to your students. Each nursery rhyme has it's own page with just the rhyme, title and images, so you can make your own nursery rhyme book with them as you go.